The 8th edition of WORD UP spoken word events is here. 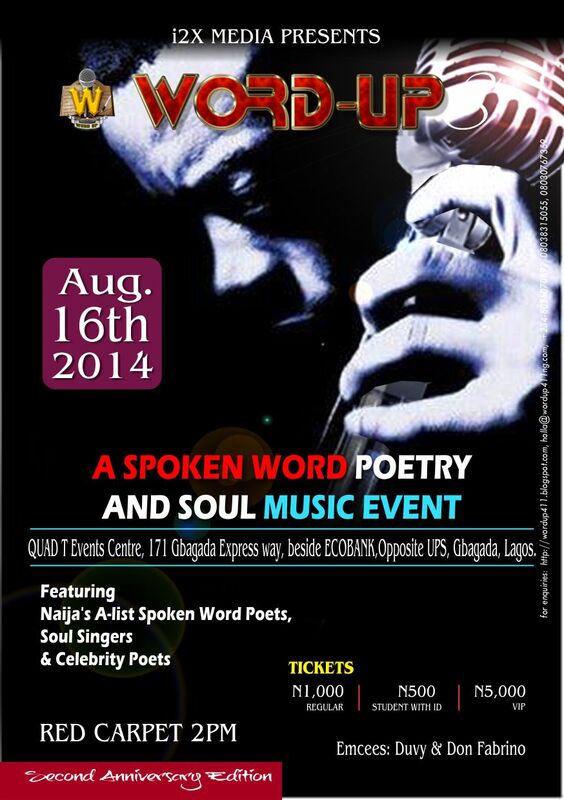 WORD UP is one of the biggest Spoken Word Poetry event in Nigeria. The event has featured the best Spoken Word Poets in Nigeria, all on one stage. Seven editions of WORD UP have been held between August 2012 to February 2014, and have featured both veteran poets and exciting new talents. This edition will be a feast of words where the audience are guaranteed a great time to hear, feel and express the power of words that inspire change, and words that makes sense out of nonsense and senselessness. There will be great intellectual content and plenty of entertainment. Venue: QUAD Events Centre, 171 Gbagada Express way, beside ECOBANK, opposite UPS, Gbagada, Lagos.